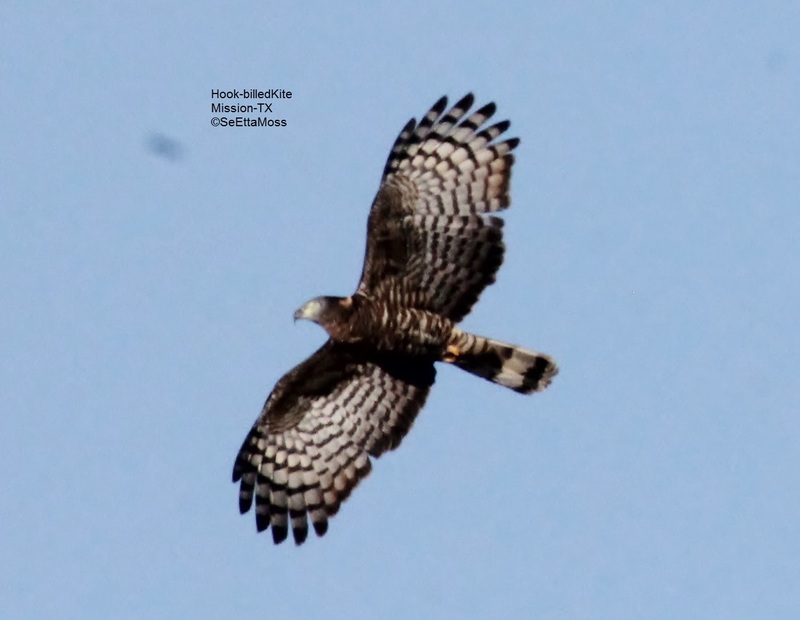 Today I returned to the Mission hike & bike trail area to look for the Hook-billed Kites again. I met Benton Basham there and a little later Bill Clark (raptor expert and book co-author)also showed up to took for the kites. 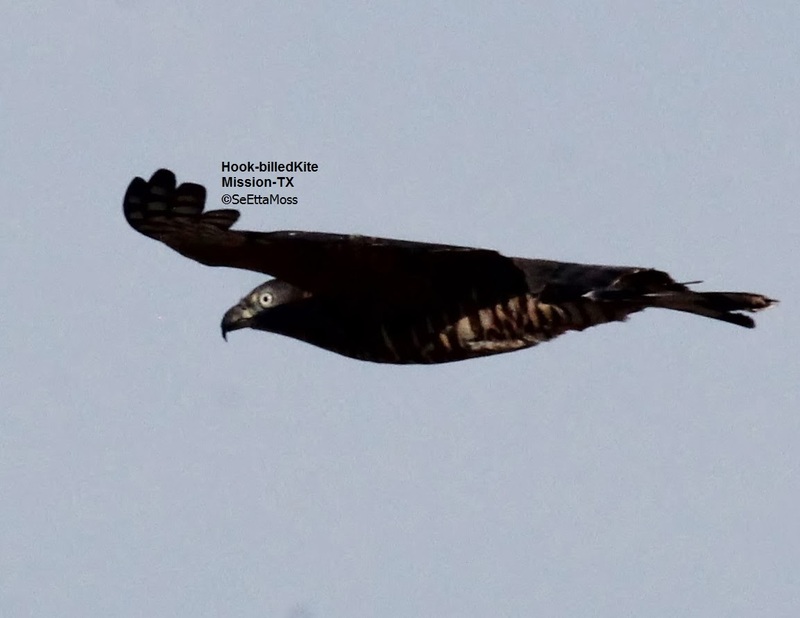 I spotted a Hook-billed Kite fly in and land in a tree a couple of hundred feet away from us. After it perched for a few minutes it flew off. A little later Bill Clark spotted a second bird. This bird also has a white iris that is found on adult birds of this species. 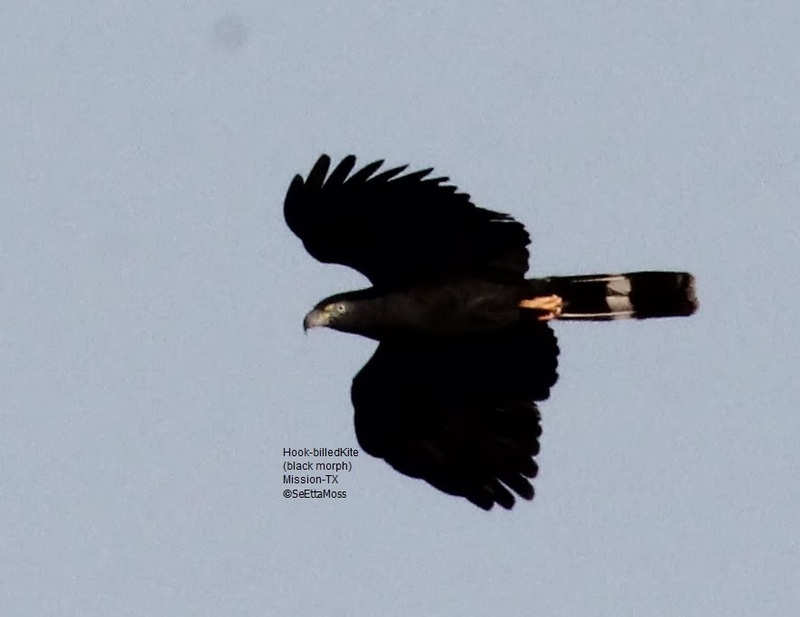 Though on a couple of these photos there are possible whitish areas on the undersides of it's remiges, but these could just be just photo irregularities (due to lighting, missing feathers, etc). 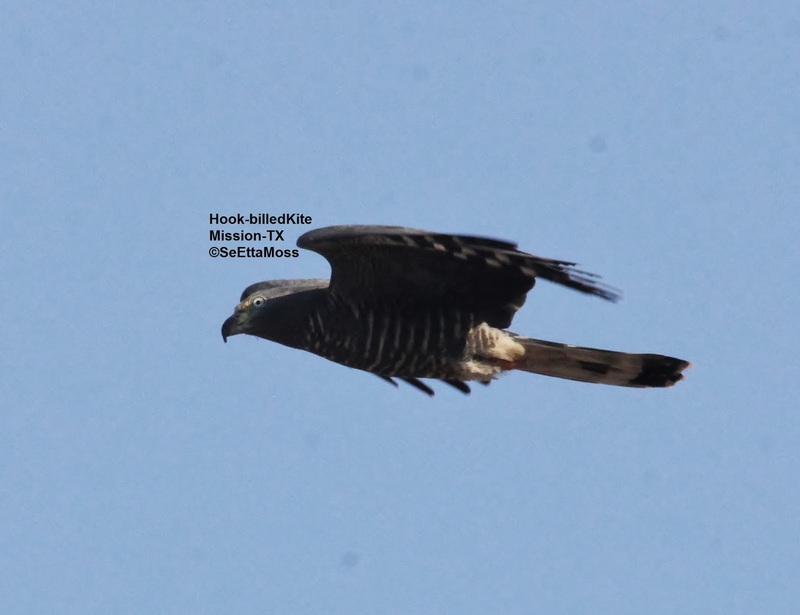 This is a adult female light morph Hook-billed Kite that I observed and photographed yesterday near the Mission bike trail as it flew back across with 2 other Hook-billed Kites during the 3rd fly by. Most outstanding is her much heavier banding than the adult male I posted below. Wheeler in his Raptors of Western North America describes the head of adult female light morphs as follows: "Gray forehead with a gray area above and under the eyes." (p.78)--these features can be seen in the first photo. He also says they have a black cap and this can also be discerned in that first photo. Wheeler says the upperwings are 'dark grayish brown'. He further states, "Whitish underside of all remiges are distinctly barred with dark brown and have a wide dark ban on the trailing edge." (p.78) Those features are seen quite well in several of these photos. After spending 2 hours with more than 20 other birders this morning watching for Hook-billed Kites, that have been reported for several days flying in the area of the Mission, TX bike trails (Nature Park area) I returned in mid-afternoon to give it another try. I didn't see anyone else there when I arrived but quickly spotted 2 Hooked-billed Kites flying low coming in my direction. I heard some chattering vocalizations during that first flight as they had been flushed according to a couple from New York that had seen them further east of me. 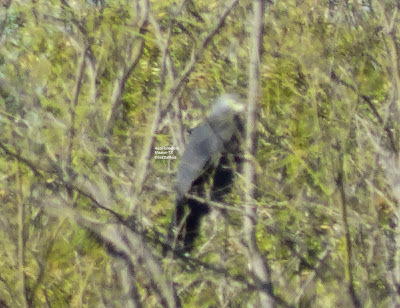 One of the Hawks landed in a tree in the mesquite forest about 250 feet away. I watched it for a full 5 minutes (per photo time stamping) where I got a very nice view through my spotting scope of his face including the "yellow teardrop over the eyes" (as described by Brian Wheeler in Raptors of W. North America).